The Air Norton™ started out simply to be the Airbucker™ version of the Norton®. 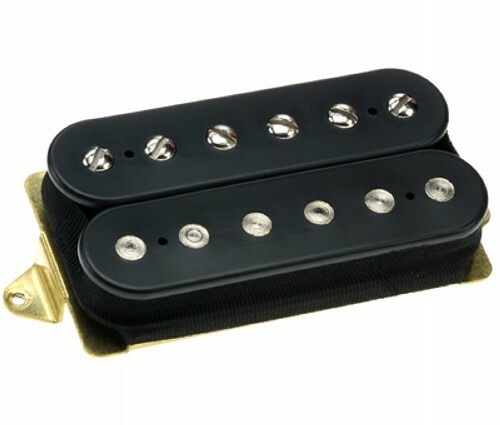 DiMarzio thought it would make a distinctive-sounding bridge pickup with high-gain amps, but they soon discovered that it's a radically neat neck pickup, too. The tone is deep and warm, but not muddy. It's hot, but not distorted. It's even got cool harmonics, which are really unusual for a neck humbucker. The patented Air Norton magnetic structure reduces string-pull, so sustain is improved; and pick attack and dynamics are tremendously controllable and expressive. Combine the Air Norton with an Air Zone™, The Tone Zone™ or Steve's Special™ in the bridge position for a perfect blend of power and tone, or use an Air Norton in the bridge position with an Air Classic™ Bridge model in the neck position for a distinctive medium-output blues-rock sound. When the Air Norton is in the neck position, it's a warm, open-sounding pickup with enough power to balance with all bridge humbuckers. Try it with 500K pots for maximum treble and harmonic presence. In the bridge position, the sound is medium output with solid lows and biting harmonics. You can try it here with 250K controls, or a 500K volume and 250K tone to fatten the highs up a little. Combines well with Air Classic in neck, and also with The Cruiser®, The Chopper™, and Blue Velvet™ single-coils. Recommended for Solid body and semi-hollow body guitars.